ClassicPress seems like a ridiculous idea. Thanks for commenting Scott! This seems highly unlikely (and unsustainable) in the long run. If WordPress were transportation, ClassicPress seems like it would be the “horse and carriage” fork. Looking at the project (to which you contribute, which is admirable), the value proposition appears to be 1) No Gutenberg and 2) more user feedback (voting) driven development. Is this right? Regarding no Gutenberg, WordPress 5.0 with Gutenberg doesn’t break anything. As a user I’d wonder what ClassicPress offers that just using the Classic Editor Plugin (https://wordpress.org/plugins/classic-editor/) doesn’t since it will be supported for the foreseeable future. The mission may have to be more substantial than that to justify the significant effort in maintaining such a fork. Regarding user driven development, I believe this may be more complex than you’re imagining. No successful product or project I’m aware of is the result of pure user feedback via voting. From over a decade in product development, using a product and building a product are different perspectives. At times, you must do things that users don’t ask for or even don’t want. What am I missing here? If I misunderstand ClassicPress, please correct me. > Over the next few years as Gutenberg develops we’ll see page builders migrate from their old (own) frameworks to Gutenberg..
> Gutenberg will definitely be a whole-page builder, that’s the entire point of phase 2. All of the infrastructure is built to support that, so it will happen much faster than phase 1. Frontend page builders/block builders will have the opportunity of speed to market with features they know their clients want. WordPress will stay an open market and the demands of markets will remain in place. Core will be able to offer some basic blocks but while hopefully fully vetted and robust, they won’t offer features that clients want. EXAMPLE: Add a 200 row table to Gutenberg right now (say for event results you want to add to a blog post)…now that you see there is no real way to do this efficiently go to your code editor and copy a clean table of 200 row/columns into the code block as a clean HTML markup…it will work eventually (200 rows, 5 columns took my page 12 minutes to load in Gutenberg), but there is a page builder that has solved this by offering a CSV upload which parses the table to JSON and even offers clickable settings for responsive, sorting and other desired features. One point Matt ha made is that the fidelity required of front-end editor to click and drag UI is not preferable or ‘easy’ for all users, I think he was specifically talking about column width drag at the time. I think that is a really solid point and why the UI of Gutenberg is going to help a ton!!! Hey Noah, thanks for commenting! There’s nuance here that we should appreciate. 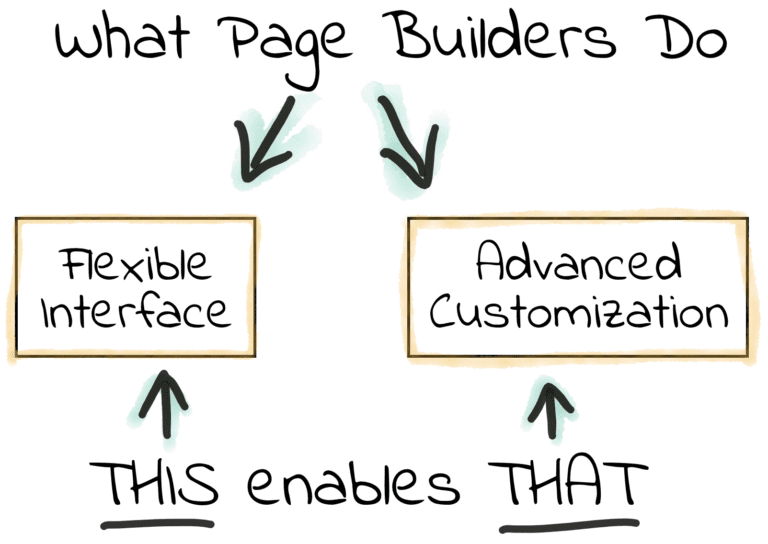 A “whole-page builder” does not mean a page builder in the typical sense. Matt means that it will be used to edit the whole page–every part of the page including sidebars, footer, etc. “Page builder” in the sense of this article implies page builder tools like Divi, Beaver Builder, Elementor, etc. These are not the same thing. The nuance is explained in the article above, but to reiterate: page builders (like mentioned above) provide advanced customization that WordPress doesn’t provide, but users want. WordPress core will have a basic “page building” framework (blocks) from Gutenberg, but as a general rule WordPress core only includes what 80% of users need (basic stuff). It won’t provide the advanced functionality that users want and page builders provide today. This role will still be filled by plugins. In the article I referred to them as customizers because that’s what page builders will do in the future once they no longer have to provide their own page building frameworks. This was a refreshing read after all the horror-stories-yet-to-be articles that abound on the Gutenberg transition. I agree that WP needs this and in the long run will be a phenomenal addition to the Core, for vanilla users and developers like that want to create custom integrations (like what Elliot Condon is floating for Advanced Custom Fields). WordPress needs this to stay relevant; I find many clients who have used services like SquareSpace and Wix, or even other CMSs like October and Concrete5 that are dissapointed in the bland and limited editor experience of WordPress. The are actually familiar already with Block Builders and that really is the future of CMS publishing platforms. This will no doubt infringe on some of the markets for the custom Page Builders like Beaver Builder, when Gutenberg can finally do basic layout of columns and rows. 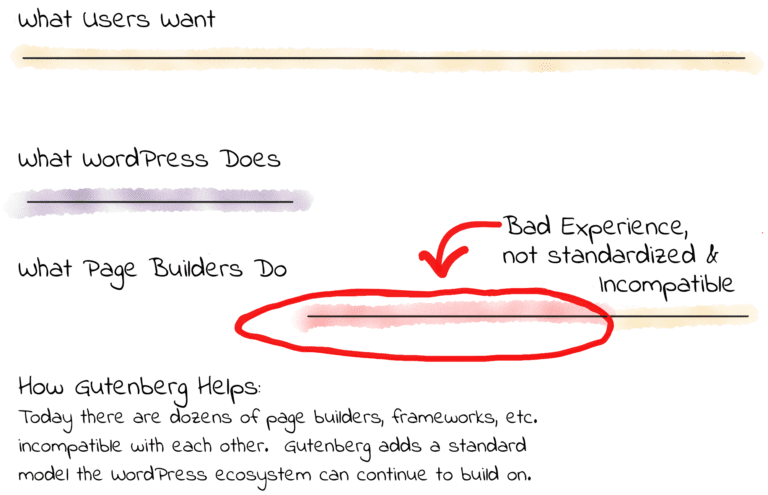 But I doubt Gutenberg will ever grow to accomodate the slew of features that the custom page builders offer. And I agree with your post entirely: this is an opportunity for them to provide a product that integrates in a more seamless way with WordPress, rather than completely commandeering the WordPress experience. It’s going to be a rough road, all major technology disruptions are, but it has to happen. I only build custom themes that rely heavily on native WordPress functions and best practices, with plugins that are already cleared for Gutenberg compatibility, so I’m not worried about my clients’ sites at all…but I only hope it’s done with as much care as I hear they are putting into it so it doesn’t completely obliterate the myriad of random plugins and off the shelf themes out there. You right, Gutenberg customizers are already emerging on the market. Stylist https://wordpress.org/plugins/stylist/ allowing you to change appearance of any Gutenberg block. You can extend any block with custom controls like margins, paddings, background colors, borders and more. While those most recognizable page builders try (if they do) to adapt to the new core editor, hundreds of new Gutenberg-specific add-ons/customizers/builders will arise. The promotion is going to be even easier for the latter since they are not ‘page builder’ competitors, but a super new enhancement for Gutenberg. A refreshingly honest evaluation of Gutenberg. As a disruptive technology to the WordPress ecosystem, it’s causing a lot of varied responses. 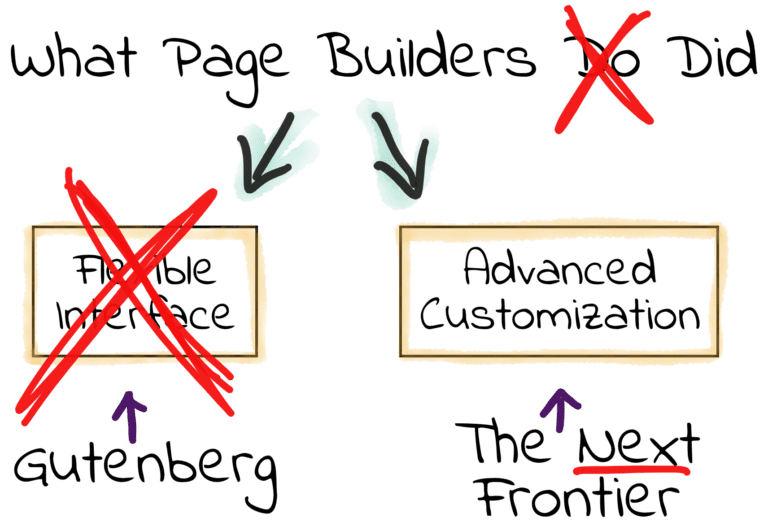 In particular, I believe page builders have a shrinking window of time to re-imagine their offering in the context of Gutenberg (Gutenberg as editor but also as block approach to websites). There are some very exciting opportunities notwithstanding the short to medium shock waves to the ecosystem. Gutenberg brought wordpress in June 24th, 1400. I do not know if I shift my sites on ClassicPress. But it is a valid option. I have been designing one of those bloated multi-themed websites that include social, e-learning, e-commerce, and SVOD (Facebook meets Amazon) lol. I began learning Drupal 7, then they changed it completely to Drupal 8 (a relearning curve). I decided to try WP because it seemed fairly simple. Then I heard Gutenberg was coming! I got the same reaction when I heard “Winter is coming!” But, I started thinking in blocks for my new wire frames and it seemed to make more sense for what I need to launch my MVP than the Classic. Although, there are Plugins from Classic that I need. But, I figure that by the time I really need them that they’ll be there or I’ll modify something. Most users of WordPress are just people adding pictures and text once a month.